Can Australia have a Local Food Act? At the beginning of November last year, the Parliament of Canada’s most populous province, Ontario, passed the Local Food Act 2013. This is a highly significant measure, because it represents one of the first instances of a sub-national legislature not only recognizing, but institutionalizing and resourcing, the growing local food movement. The local food movement has been pilloried by many and dismissed by others as little more than a ‘feel-good niche sector’, catering to the demands of the ‘worried well’ for ethical produce, but with little prospect either of feeding the hungry masses or of improving the bottom line of producers. I have news for those critics. Local food is here to stay; and its significance and impact will only grow in the coming years. 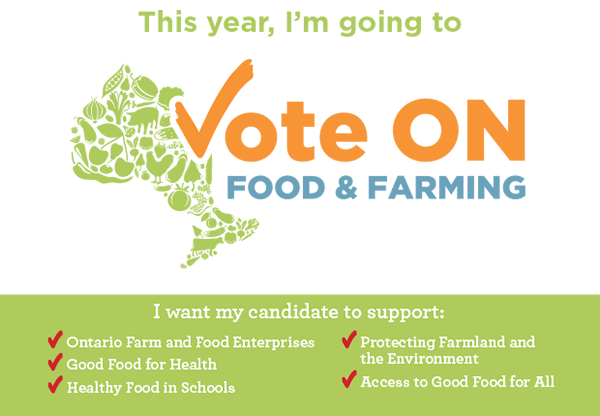 Ontario has robust and resilient local food systems: a highly productive agricultural land base, a favourable climate and water supply, efficient transportation and distribution systems, and knowledgeable, innovative farmers, food processors, distributors, retailers and restaurateurs. These resources help ensure that local food systems thrive throughout the province, allowing the people of Ontario to know where their food comes from and connect with those who produce it. The variety of food produced, harvested and made in Ontario reflects the diversity of its people. This variety is something to be celebrated, cherished and supported. Strong local and regional food systems deliver economic benefits and build strong communities. Maintaining and growing Ontario’s local and regional food systems requires a shared vision and a collaborative approach that includes working with public sector organizations. The process of setting goals and targets to which the people of Ontario can aspire provides an opportunity to work with industry, the public sector and other partners to promote local food and to develop a shared understanding of what needs to be done to support local food in Ontario." The arguments for supporting local food are multi-dimensional. Certainly the economic case is emphasized, and rightly so, because the benefits of the type of economic development fostered by local food systems are widely spread amongst all the players along the food value chain. And if those businesses are locally owned, as they often are, then the economic multiplier effect is strongly enhanced. But in addition to the economic case, local food systems promote healthier eating habits (think school kitchen gardens), can improve access to good food for low income and vulnerable populations, and can encourage producers to transition to more sustainable and ethical practices of land-use management and animal husbandry. The reference to public sector purchasing is of particular importance, as the adoption of procurement goals and targets has been critical in nurturing infant local food enterprises, such as Local Food Hubs. The Local Food Act specifies that the goals and targets set by the Minister may be ‘general or particular in [their] application’. This means that the Minister can set targets for particular businesses or public sector organisations (including hospitals and aged-care facilities); for particular geographical areas; and for particular food groups. 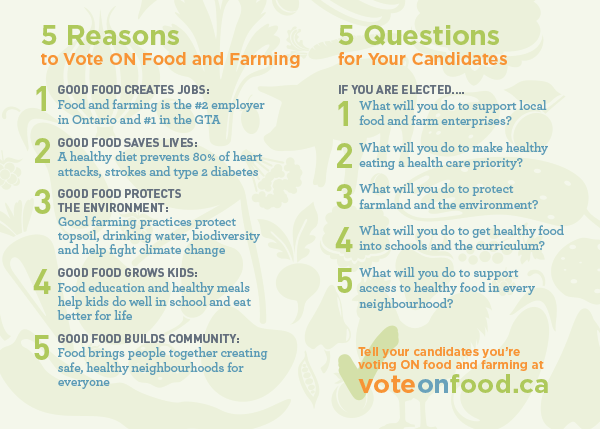 The Vote ON Food campaign, which led to the Local Food Act 2013 — front of postcard. The Vote ON Food campaign, which led to the Local Food Act 2013, back of postcard. The Act also has a social justice intention: it creates a ‘community food program tax credit’ for farmers who donate produce to food banks and similar organisations, of up to 25% of the ‘fair market value’ of that produce. In addition to the Local Food Act, the Ontarian Government has also created a Local Food Fund, worth up to C$30 million over three years to support innovative projects that enhance the purchase of local food and contribute to economic development. No Australian state has done anything similar. AFSA believes it’s high time that changed. This year is an election year in the State of Victoria, which has quite probably the most numerous and most cohesive local and fair food movement in Australia – during Fair Food Week 2013, out of 112 events around the country, over 42 took place around Victoria. The City of Melbourne became the first local government member of AFSA last year. Southern Melbourne, Mornington Peninsula and Geelong are amongst some of the LGAs adopting and implementing local and regional food strategies. The time is right. The case for government support and resourcing of the growing local and fair food movement is overwhelming. With the globalization of food and agriculture increasingly revealed as a zero-sum race to the bottom for all but the transnational corporations who control the so-called ‘free trade’ in food and agricultural products, the need for bold visions and new approaches to meet current and future challenges has never been greater." AFSA is actively looking for a campaign team to work on the project of a Local Food Act and Local Food Fund for Victoria, to culminate in Fair Food Week. One fast-developing area of Food Sovereignty is indigenous food sovereignty, especially in Canada. In March 2008 the British Columbia Working Group released the final report of their Working Group on Indigenous Food Sovereignty. Sacredness – Food is a gift from the Creator; we have a sacred responsibility to nurture healthy, interdependent relationships with the land, plants and animals that provide us with our food. Self-determination - The ability to respond to our own needs for safe, healthy, culturally adapted Indigenous foods - the ability to make decisions over the amount and quality of food we hunt, fish, gather, grow and eat. Freedom from dependence on grocery stores or corporately controlled food production and distribution in market economies. After 18 months of public forums and discussions with farmers and community leaders across Canada, the New Democrat Party recently released its report to guide the development of national food policy for Canada. As Australia considers its own National Food Policy, the findings and recommendations of this report are highly relevant, given the demographic, cultural and agricultural similarities between the two countries. Canadians across the country have called for a [comprehensive] food strategy to ensure Canada's food security and food sovereignty. The AFSA makes the same call in relation to Australia.